Q: Why should you take my advice about chameleons? I’ve hatched thousands of baby chameleons, spanning 18 different species. I’ve successfully crossed and hatched baby hybrid chameleons (Furcifer pardalis x Furcifer oustaleti). I’ve successfully bred and hatched thousands of Veiled and Panther chameleons. I’ve received eggs from the much-heralded Yellow-lip Parson’s chameleon (still incubating). Q: Can chameleons make good pets? A: Yes! Once set up correctly, chameleons can thrive in captivity as wonderful reptile pets that never cease to entertain. 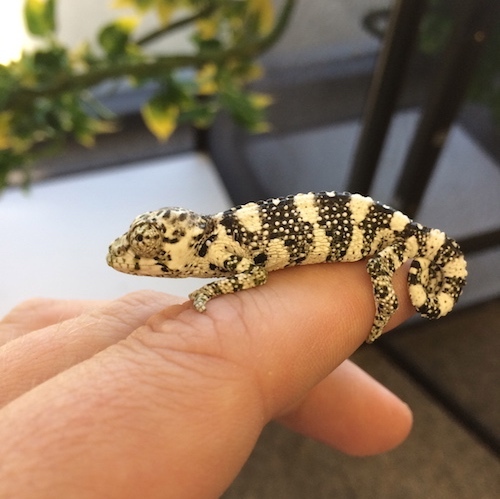 There are a few key components that make their care a bit different than most lizards, so read through my website to understand their simple yet important care requirements. They are easy to maintain, easy to feed, and are slow-moving so they don’t dart away like some reptiles. Certain species make better pets than others, but we’ll cover that as you continue to read. I’ve put together a list of the top five best pet chameleons. A: Chameleons can bite, like most every animal, but they’re usually very reluctant to do so. I’ve only been bitten by little babies, and it’s pretty cute when it happens. 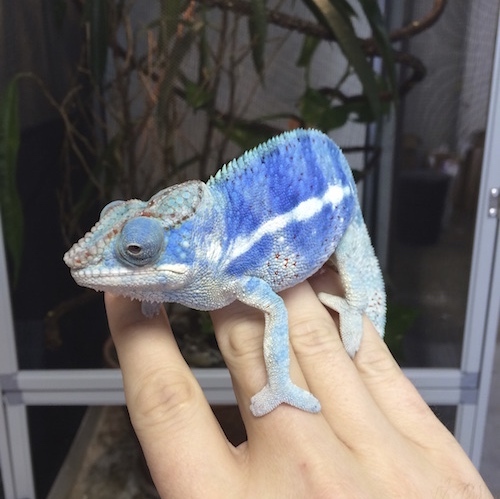 I’ve never been bitten by a juvenile or adult, and I’ve handled thousands of chameleons, including some of the more aggressive species. Plus, chameleons don’t have sharp teeth, they’re pretty blunt. Q: What do pet chameleons eat? A: Chameleons will eat a variety of insects in the wild, but in captivity, I recommend feeding them appropriately-sized crickets. I feed my chameleons crickets about 90% of the time, with hornworms and roaches making up the remainder. Read my article ********* to learn what foods are most nutritious for your pet chameleon, and which foods to avoid. Read my article, “What do pet tarantulas eat” to learn more. Q: Can chameleons make good pets for kids? A: There’s no question about it, chameleons can make great pets for kids. Here’s why—first, they don’t demand a tremendous amount of care when set up properly, and second, they are quite slow and it’s virtually impossible for one to run away from you. In fact, they’re very awkward on the ground (most chameleon species are strictly arboreal, meaning they live in trees and bushes), and so they aren’t quick and can’t dash away. It’s almost comical when they try to walk on the ground. Try catching an anole, swift, iguana, or monitor lizard once it’s out of your grasp! (Furcifer pardalis), a highly recommended species. A: Nope, chameleons can’t jump. They can’t stretch and reach for new climbing branches, but their actions are usually very slow, calculated, and deliberate. Q: How often should you feed your pet chameleon? A: In the wild, they eat when they can—it’s called being an opportunistic feeder. It’s survival. In captivity, where feeder insects are plentiful and inexpensive, plan on feeding your pet chameleon every day when they’re babies to juveniles, and every other day when they reach adulthood. This is the feeding regimen I’ve used for years and it’s served me (and the chameleons) really well. A: Nope, chameleons don’t hibernate. Fun fact: some species of chameleon lay eggs that go through a type of hibernation called “diapause.” Simply put, this is when the eggs must go through a period of little to no development during the colder season. a smaller, beautiful, slightly challenging species. (Calumma parsonii), an Orange-eye to be exact. Q: How long can chameleons live? A: This once again depends upon the species. Generally speaking, the smaller the chameleon, the shorter the lifespan. The larger the chameleon, the longer the lifespan. Pygmy chameleons live around two years on average, while it’s believed that the large Parson’s chameleon can live in excess of 20 years. I’ll explain several factors that affect their lifespans. Q: Do chameleons need Ultraviolet (UV) lighting? A: Yes, although some species seem to need it more than others. I give all my chameleons, big and small, young and old, access to UV lighting. I’ll expound upon this in the care section. Q: Do chameleons need a basking light? A: In my own personal experience, I like to give chameleons choices. So, rather than assume they don’t need a basking spot, I give them the option, and you know what? Many of them will bask, even the montane (mountain) species. Some never do. I use 65w halogen flood bulbs, which don’t give off a ton of heat. Regardless of the species in question, it’s always best to give your pet reptile options. Let it decide what it needs on its own. This is one of the biggest mistakes I see with reptile hobbyists—they think they know what’s best, but really, the lizards do. a species that is rarely bred or hatched in captivity. Q: What temperatures do chameleons need? A: Most chameleons prefer room temperature, so right around 68F-76F. I’ve had excellent success keeping, rearing, and breeding chameleons within this temperature range year-round. Letting the temperatures cool a bit lower at night is absolutely fine. While many hobbyists and breeders don’t offer basking spots, I keep mine with a surface temperature around 90F. Q: Should you buy a baby or adult chameleon? A: This is a double-edged sword. 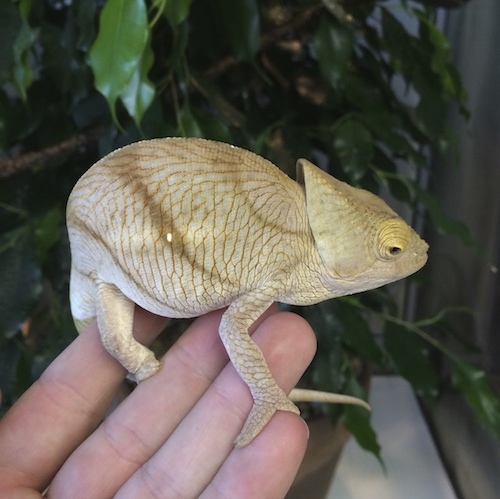 While the thought of starting with a baby chameleon may sound appealing, and it can be, keep in mind baby chameleons are one of the most challenging reptiles to raise in captivity. They require tiny food items such as fruit flies and pinhead crickets, constant humidity, and enough space not to feel stressed. I usually recommend starting with a juvenile (3-4 inches long) to adult. Babies are for experienced hobbyists. 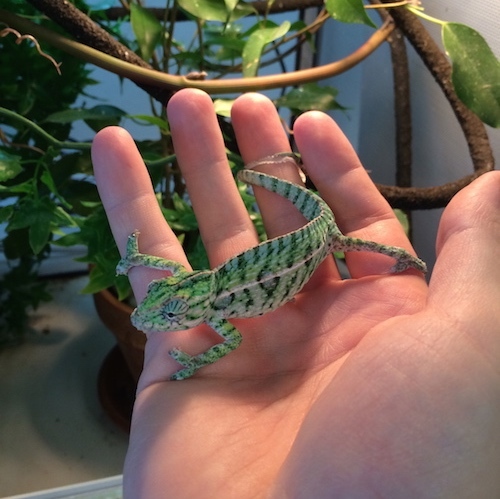 I don’t want to scare you away from baby chameleons—it’s a very rewarding experience raising them. Just be aware that it takes more time and effort. I wrote an article on baby chameleons that you’ll find helpful. Q: What’s the difference between males and females? A: In my experience, there’s not a real noticeable difference in personality—males might be a bit more bold, females a bit more reclusive. One difference worth mentioning has to do with coloration. Now, this isn’t an exact science, but generally speaking males are more colorful than females. This is common in the animal world, so should come as no real surprise. This is certainly most noticeable in Panther chameleons, and much less noticeable in many popular species including the Veiled, Jackson’s, Meller’s, Oustalet’s, Rudis, Senegal, Graceful, and Fischer’s species. Another difference is that males tend to live a little longer because they don’t have to go through the taxing process of reproduction. Developing and laying eggs, especially if it’s done at an immature age (before reaching adult size), is very demanding on the female’s body. It can noticeably shorten their lifespan. Females can even develop and lay eggs without a male around, although the eggs would of course be infertile. A final difference worth noting is that with the horned species, males usually have the horns, and females don’t. This is exemplified by Jackson’s, Two-horned, Three-horned, and Four-horned chameleons. At the very least, males have more horns than the females. A prime example of this would be in the Mt. Meru and Werner’s chameleons. Q: Can pet chameleons be handled? A: Most chameleon species are fine with interacting with their keeper, and many will walk right onto your outstretched hand. Generally they’ll navigate up your arm to the top of your head if you’ll let them, as they like being elevated. In fact, it’s advantageous to keep their enclosures elevated above the ground as it helps give them a more commanding, confident view of the room. I keep my enclosures about five feet off the ground. Q: What size chameleon cage is ideal? A: There are four main screened chameleon cage sizes: 16” x 16” x 20”, 16” x 16” x 30”, 18” x 18” x 36”, and 24” x 24” x 48”. It really depends upon the size of the chameleon, and we’ll get into more detail in the care section. I highly recommend using screened cages for almost every species of chameleon, with Pygmy chameleons being a notable exception as they are ground-dwellers. You can also read my chameleon care sheet for very detailed information on how I keep my own chameleons. Q: Can you keep more than one chameleon per cage? Never keep more than one male per enclosure. They will become territorial and it will cause tremendous stress. Keeping 1-3 females per enclosure can usually be done without issue. Keeping a harem can work, which means one male and 1-3 females. Pygmy chameleons (Rhampholean sp. )can be kept communally. Q: Where do chameleons live? A: Chameleons are primarily found in Africa and Madagascar, but a few are found in Southern Europe, the Middle East, and India. I’ve got another page dedicated to where chameleons live. Q: Why do chameleons change color? A: Many people think chameleons change color to match their surroundings, which is actually a myth. It would make sense, but it’s still a myth. They instead change color based upon their mood and temperature. For example, if they’re stressed, defending their territory from another chameleon, or trying to attract a mate, they can fire-up their colors quickly. If they’re cold, they’ll often turn dark colors in an attempt to absorb more heat from the Sun. Q: Do chameleons lay eggs or give live birth? A: Both! The vast majority lay eggs, but several species give live birth including Jackson’s, Mt. Meru, Werner’s, and Rudis chameleons, all of which I’ve had give successful live births in my care. Q: Do you recommend any other chameleon websites? A: Absolutely! 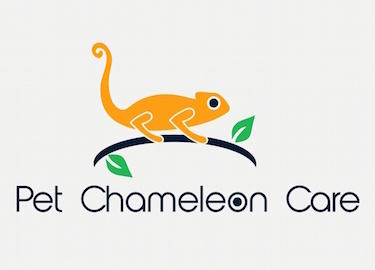 Check out the Chameleons E-zine, Melleri Discovery, and Chamaeleonidae.